This past weekend while the rest the rest of the family was out of town visiting my sister and bro-in-law, I took to the garden to spruce up my new growing space. Last week I tore down the greenhouse. It took two truck loads of mulch to cover the area. Its now covered somewhere around 6 inches deep. Though, I’m sure some Bermuda grass with find it’s way to the top. I took my big compost bin and made smaller ones. 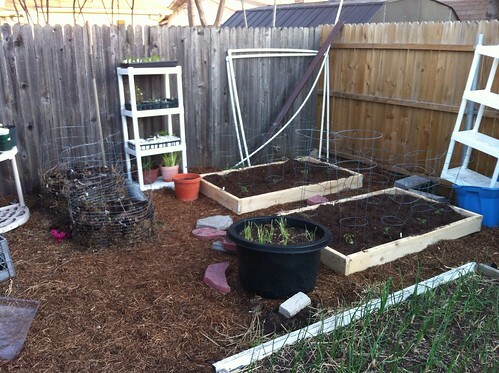 After adding new boxes and some dirt/compost I finally planted the ladies of the garden. Love they new space. You should see our front yard right now. It’s all jacked up with soil piles everywhere. Definitely a cleaner look…love it! Hope the mulch works well for you.